Do you have a well pump and pressure tank diagram you can send me? My son asked me how our well works, and I was trying to find some basic diagram that showed all the working parts. We have what I think is pretty typical well here in Montana, a submerged pump down in the ground, and a pressure tank on top. By the way, I got your test kit and that worked great, thanks again for helping me sort out my well problems. Thanks for emailing and glad you were able to test your water using the test kit. 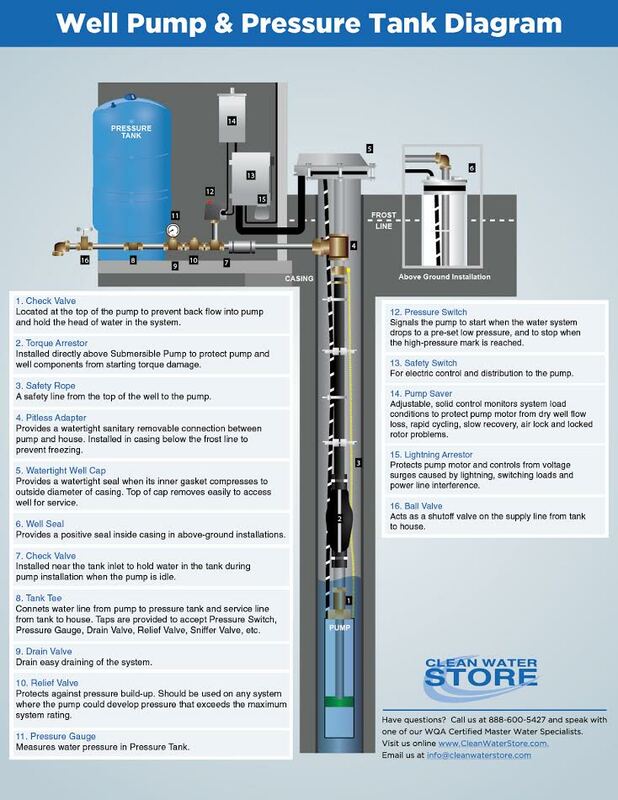 See below for a typical well water and pressure tank diagram we created. Here (below) are the main components of the most modern submersible pump and pressure tank systems. Your well system may not have all these parts but you will have at least the submersible well pump, check valve, pressure switch and pressure tank. Located at the top of the pump to prevent backflow into the pump and hold the head of water in the system. Installed directly above Submersible Pump to protect pump and well components from starting torque damage. A safety line from the top of the well to the pump. Provides a watertight sanitary removable connection between pump and house. Installed in the casing below the frost line to prevent freezing. Provides a watertight seal when its inner gasket compresses to the outside diameter of the casing. Top of cap removes easily to access well for service. Provides a positive seal inside the casing in above-ground installations. Installed near the tank inlet to hold water in the tank during pump installation when the pump is idle. Connects water line from the pump to pressure tank and service line from tank to house. Taps are provided to accept Pressure Switch, Pressure Gauge, Drain Valve, Relief Valve, Sniffer Valve, etc. Drain easy draining of the system. Protects against pressure build-up. Should be used on any system where the pump could develop pressure that exceeds the maximum system rating. Measures water pressure in Pressure Tank. Signals the pump to start when the water system drops to a pre-set low pressure, and to stop when the high-pressure mark is reached. For electric control and distribution to the pump. Adjustable, solid control monitors system load conditions to protect pump motor from dry well flow loss, rapid cycling, slow recovery, airlock and locked rotor problems. Protects pump motor and controls from voltage surges caused by lightning, switching loads and power line interference.